Monroe and Main is a company that sells women's clothing, swimwear, outerwear, accessories, and shoes. While browsing their website, I saw many beautiful pieces of clothing and shoes that I liked. For my review, I chose the knee high boots seen above. I have worn these boots the past two days to my internship and love them. They are completely flat which is nice for walking around. They are very comfortable and even after a full day, my feet don't hurt at all. The boots retail for $99.95 and are made of pieced microsuede which can be worn over the knee or folded down. I think that it is really cool that they can be folded down if you don't want to wear them so high. One of my biggest concerns was whether the kneee high height would be appropriate for work. I tried them out with a couple of outfits before wearing them to the internship and found that they are completely fine. They do not have a trashy feel even though they are so high. They come in only brown. Something kind of neat is that the boots can get slouchy too on me which is another look. I love the snaps. These boots could be worn to work, out on a date, or lounging around on the weekend. I am thrilled with my new boots and know that I will get tons of use out of them throughout this winter. Sponsors reserves the right to substitute the giveaway product for an item of equal or greater value depending on sizing and inventory. Disclosure: I received this item free of charge from Midnight Velvet. No monetary compensation was received. All opinions expressed are my honest thoughts on this product. The Vienna Walking Coat is lovely! The boots look amazing too! I really like the Coat, Long and Quilted. Looks like it would keep me nice and cozy all winter long! I love the Tumbled Leather Handbag. I love leather purses. i also like the wedge heel mukluks! too cute! i love the yochi slide wedge! Their Parka Jacket, Wool Blend in Black caught my eye at Monroe and Main! Those boots are *awesome*! I like the Kimono Tunic, too! I think the Handbag, Brook by Marc Chantal is just beautiful and I would love to own it. I love the Chiffon Insert Dress in black and purple! Very pretty with the sparkles at the waist! I am crazy for the Jacket Large Button in red. I like the Ivory Tree shoes by Aerosoles. I like the Marilyn sweater. I love the Double Take Tunic! I also like the Clarks Boot, Dream Belle. I like the lace-up jog suit, cute! I love love love these boots! My favorite thing on their website would be he Gray Knit Tunic, Layered Crinkle. I just think that would look so cute with a pair of leggings! I love the Plaid PJs! I like the saucey boot! I love the Addison boot! I like the Bootie by Sporto in Black. I like The Dress for Every Shape. Really like the Andiamo Court shoe. I think the Jewel Shimmer Dress is pretty!! I love the Dakota Boots! I like the hooded faux suede jacket. $99.95 in brown and pink. Oooh I love the Mule by Hush Puppies, Unwind.. they look so comfy. I also really like the Indigo Boot, by Annie Laurie. 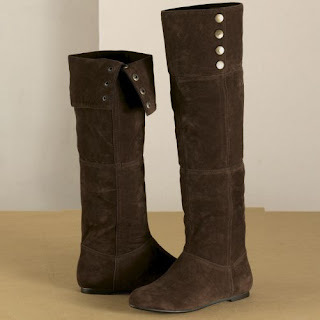 But I'm really REALLY liking these brown knee high boots.. I am in need of a great pair of boots like these! Marled Tweed Cardigan for me! I like the Pump, Rhinestone Flower by Midnight Velvet. I like the Suit, Classic Screen Star! I like the Dress, Ruffles, Braid Trim in purple. i love the Candace Satin and Pearl Cardigan! I love the Dakota Boots. I like the Kimono Tunic. I love the Carmen Mio one piece swimsuit. My favorite items is Handbag, Brook by Marc Chantal.